U.S. industrial designer born in St. Paul, Minnesota, who entered the University of Washington as an architectural student, but World War I interrupted his study and he served in the U.S. Navy in 1917. In the 1920s, he worked as a graphic designer in Chicago, and was one of the founders of the Chicago Society of Typographic Arts. In 1931 he relocated to join with Harold van Doren in opening an industrial design office in Toledo, Ohio, where they developed a growing business. From 1933 to 1935, they designed Art Deco products, including a plastic radio for Air King, casseroles for Wagner, scales for the Toledo Scale Company, and bicycles, tricycles, scooters and wagons for the American National Company. In 1935, Rideout left Van Doren to open his own office, John Gordon Rideout and Staff, in Cleveland, Ohio. 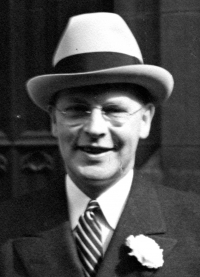 The reason was primarily to be near his fiancée, Alice Chalifoux, a concert harpist with the Cleveland Symphony Orchestra, who he married in 1937. During World War II, Rideout closed his office in 1941, but reopened in 1943 in Chagrin Falls, Ohio, and in 1944 joined with architect Ernest payer to combine industrial design and architecture. In 1944 he was one of the 15 founders of the Society of Industrial Designers (SID).